By Peter Anderson 8 Comments - The content of this website often contains affiliate links and I may be compensated if you buy through those links (at no cost to you!). Learn more about how we make money. Last edited September 28, 2008 . My wife and I, along with her parents, have been planning on going on a Mediterranean cruise for the past year or so. My wife and her parents had never been to Europe, and for all of us taking an extended vacation in Europe was a lifelong dream. Last year we started looking into cruises. After much back and forth, we finally booked a 12 day Mediterranean cruise going from Barcelona around to Venice. It was going to be a trip of a lifetime! On September 6th we finally flew out of Minneapolis/St. Paul International Airport, headed for Barcelona, and the start of our cruise. Our flight was rather uneventful, they make the flights a lot easier nowadays by having personal “entertainment devices” attached to each seat, which means you can view a movie of your choosing, watch TV shows, play games with the attached remote or view a map which shows the plane's progress to your destination. We arrived in Barcelona after a stopover in Amsterdam, and took a taxi to our hotel. We all checked in and crashed after our 14 hours of travel. After our naps we got up at around 6pm to go out and see some sites, get some dinner, and just get a feel for Barcelona. We got up and took a taxi a short distance to one of the main pedestrian and shopping streets in Barcelona, Las Ramblas. The street is thronged with all sorts of people shopping, street performers, pickpockets and more! It really was a lot of fun walking down this street people watching, checking out the vendors, etc. Here's a panorama that I took of the plaza. After we ate dinner on Las Ramblas (Pizza!) we took another taxi ride to a beautiful street on Montjuic (where the 1992 Olympics were held). At the top of the hill is a huge complex of fountains that light up at night, and shoot streams of water in sync with music. 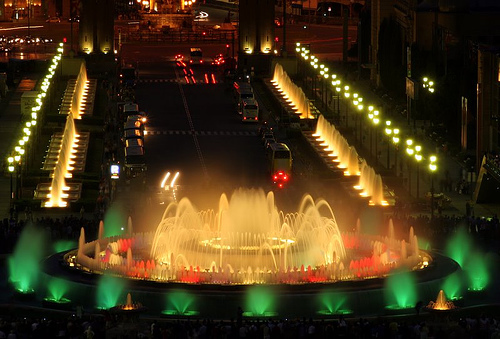 They call it Font Màgica, or the Magic Fountain. We watched as the jets of water pulsed into the air to some powerful Pavarotti. It was enough to send chills down my spine. If you ever get a chance to see the fountains in action, don't hesitate. The next morning we dropped our bags off at the cruise ship, and then proceeded to do some more touring of Barcelona. 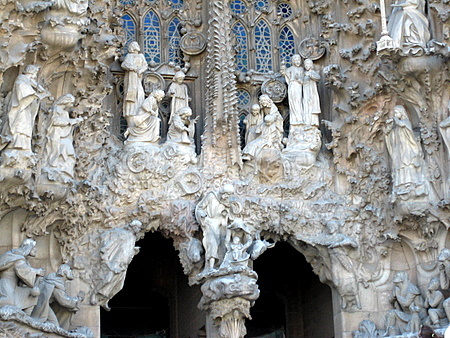 We went to the Famous “La Sagrada Familia” cathedral that has become the symbol of Barcelona. The church is amazing. The intricate designs, symbolism and hard work that went into this beautiful place of worship are mind boggling. 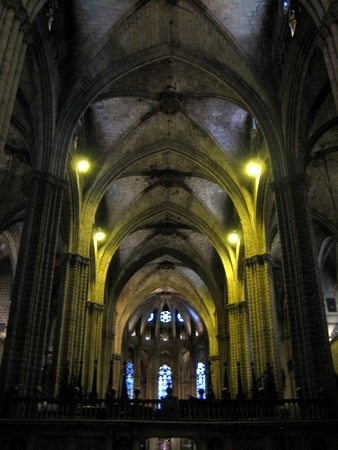 Next we went to the Barcelona Cathedral, which according to our taxi driver was a highlight of Barcelona. We weren't disappointed, it was gorgeous. It had towering ceilings, beautiful artwork, and a private garden with fountains outside of one door. After we did our tour of the Cathedral, we had to rush back to the cruise ship because we were leaving port in an hour or so. We got on the ship, and enjoyed a beautiful Barcelona sunset as we sailed towards our first stop at Villefranche, France where we would visit beautiful cities such as Nice, Eze and Monaco. After a day at sea relaxing after all our travel, we pulled into the sheltered bay at Villefranche, France. This tiny village wasn't big enough to have an actual port where the cruise ships pull in, so we had to jump on tender boats to be ferried ashore. Once on shore we jumped on tour buses for our day's events of going to the villages of Nice, Eze and then finally to the great principality of Monaco! 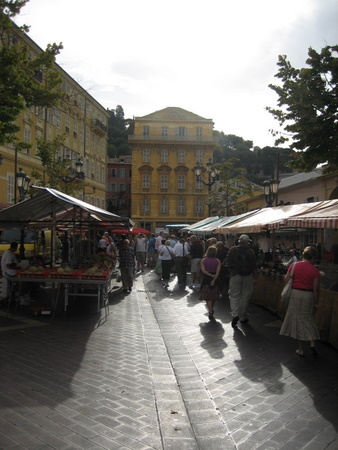 First, we drove to Nice on the French Riviera. While there we walked around the streets, toured a village farmer's market, enjoyed some sunshine, and took in the beautiful beach. Nice is just down the road from Cannes, where the famous film festival is, and if you've seen pictures of that area, you can imagine what it looks like in Nice. It is beautiful – as are all the multi-million dollar yachts that are anchored just offshore. 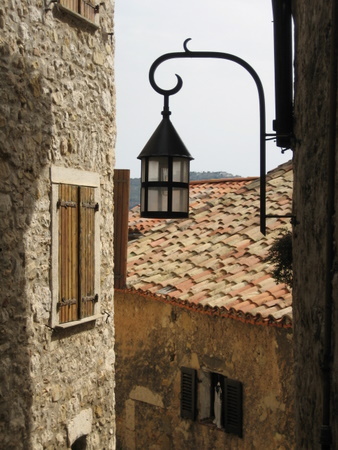 Next we headed down the road a ways to the tiny ancient village of Eze. Eze is perched up on the cliffs near the coast, but isn't really much of a working village anymore, its more of a tourist location. In any event, its one of the most picturesque little villages you'll ever go to. After having lunch in Eze our group headed on down the road to the Principality of Monaco, one of the smallest countries in Europe, also know to be a tax haven for the rich and famous. Once we arrived we went on a tour of the famous Monte Carlo Casino, where rich Saudi princes and Texas billionaires go to lose millions at the card tables (or 007 chases down bad guys – if you like Bond). The casino was beautiful, but expensive. One couple on our tour got rum and cokes while at the casino. Two drinks for a total of $40 Euros! (almost $60, definitely not frugal!). After leaving the casino we toured the Rock of Monaco, where the royal palaces are and got a gorgeous view of the city. Last Edited: 28th September 2008 The content of biblemoneymatters.com is for general information purposes only and does not constitute professional advice. Visitors to biblemoneymatters.com should not act upon the content or information without first seeking appropriate professional advice. In accordance with the latest FTC guidelines, we declare that we have a financial relationship with every company mentioned on this site. I love Nice and Cannes, been there many times. Did you check out some of the small cafes in the area? Looks like you had a fantastic time! We had a quick snack at one of the small cafes in Nice. We were on a big ship organized bus tour, so we didn’t have a ton of free time. But we DID have a great time though. Mirandas last blog post..Why $700 Billion for the Bailout? Looks great – which cruise line and ship? Its nice when the inlaws do that. I hope I can afford to do that for my offspring when I retire – but I need Congress and Paulson to take some action soon to fix our present problems and save my portfolio. Wow…that sounds like a great trip! I would love to go on a cruise there. Thanks for sharing about your trip! Previous Post: I Guess I Spoke Too Soon!? No Deal on $700 Billion Bailout.. Yet.